College says it is "committed to working with all its students"
NEW YORK (CNN) -- A recent college graduate is suing her alma mater for $72,000 -- the full cost of her tuition and then some -- because she cannot find a job. Trina Thompson has sued her alma mater, Monroe College of New York. 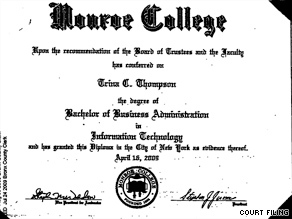 Trina Thompson, 27, of the Bronx, graduated from New York's Monroe College in April with a bachelor of business administration degree in information technology. On July 24, she filed suit against the college in Bronx Supreme Court, alleging that Monroe's "Office of Career Advancement did not help me with a full-time job placement. I am also suing them because of the stress I have been going through." The college responded that it offers job-search support to all its students. In her complaint, Thompson says she seeks $70,000 in reimbursement for her tuition and $2,000 to compensate for the stress of her three-month job search. As Thompson sees it, any reasonable employer would pounce on an applicant with her academic credentials, which include a 2.7 grade-point average and a solid attendance record. But Monroe's career-services department has put forth insufficient effort to help her secure employment, she claims. "They're supposed to say, 'I got this student, her attendance is good, her GPA is all right -- can you interview this person?' They're not doing that," she said. Thompson said she has fulfilled her end of the job-search bargain, peppering companies listed on Monroe's e-recruiting site with cover letters, résumés and phone calls. But no more than two employers have responded to her outreach, and those leads have borne no fruit. Her complaint adds, "The office of career advancement information technology counselor did not make sure their Monroe e-recruiting clients call their graduates that recently finished college for an interview to get a job placement. They have not tried hard enough to help me." She suggested that Monroe's Office of Career Advancement shows preferential treatment to students with excellent grades. "They favor more toward students that got a 4.0. They help them more out with the job placement," she said. iReport.com: "Don't sue your alma mater"
Monroe College released a statement saying that "while it is clear that no college, especially in this economy, can guarantee employment, Monroe College remains committed to working with all its students, including Ms. Thompson, who graduated only three months ago, to prepare them for careers and to support them during their job search." Thompson says she has not hired an attorney to represent her because she cannot afford one. When she filed her complaint, she also filed a "poor person order," which exempts her from filing fees associated with the lawsuit. Asked whether she would advise other college graduates facing job woes to sue their alma maters, Thompson said yes. "It doesn't make any sense: They went to school for four years, and then they come out working at McDonald's and Payless. That's not what they planned." CNN's Kristen Hamill contributed to this report.